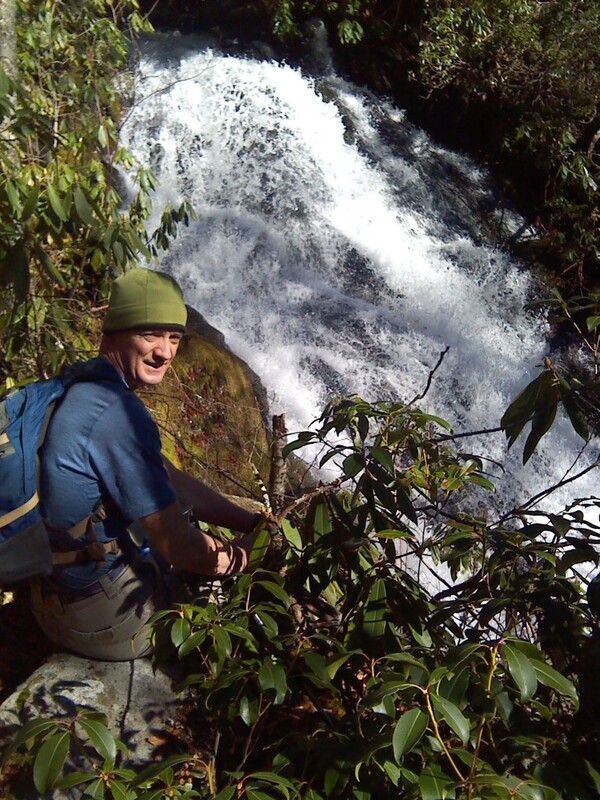 One of the advantages of the mostly snowless winters in western North Carolina is the great hiking to be had. With the leaves off the trees, beautiful views abound—and the body heat you build up with strenuous walking, paired with the often sunny, crisp weather, makes for very comfortable temperatures. With this in mind, we recently headed out to Joyce Kilmer Memorial Forest and the Cherohala Skyway to do a long day hike. We first left a vehicle in the parking lot at Joyce Kilmer, then shuttled up to Unicoi Gap Overlook on the Cherohala Skyway to begin the walk from the trailhead. On that clear day, the views from the Skyway alone would have been worth the trip, but there was more to come. 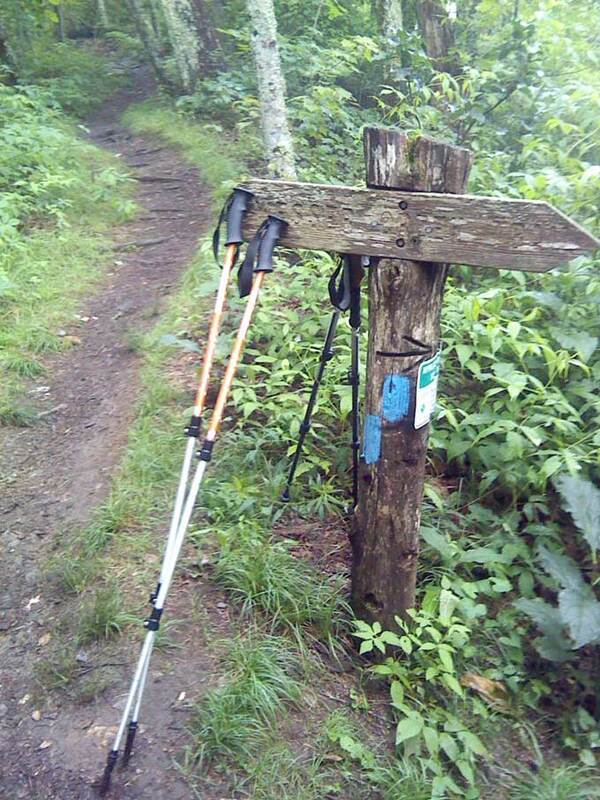 We headed out on the trail at about 10 am to follow a spine that marks the border of North Carolina and Tennessee. It was a slow but steady uphill to Bob Stratton Bald, where we stopped for lunch in the sunshine to take in the view. 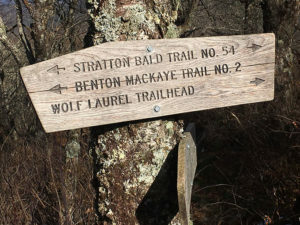 This bald is also known as Stratton Bald and Bob Bald, but it’s the same grassy bald, named after the same person, dotted with thickets of heath and a stand of fir trees. It’s also at an elevation of 5,360 feet. We were hiking in the Joyce Kilmer-Slickrock Wilderness, which meant that signage was minimal and we really had to pay attention to where we were on the trail, knowing which turns to look for. 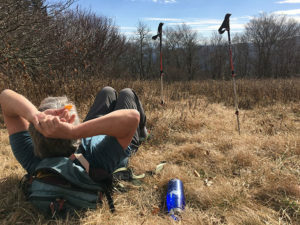 Back on the path, we headed down, down, down, following the Benton McKaye Trail, past the Naked Ground campsite where, as Jim Parham says in his Backpacking Overnights: NC & SC guidebook, you can watch the sunrise from your sleeping bag. We then followed the switchbacks of Naked Ground trail through a northern hardwood forest where we were treated to the sight of some very large old-growth trees–the few that grow outside Joyce Kilmer Memorial itself. 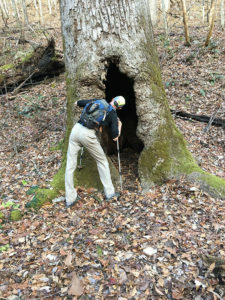 Several were so hollow a Hobbit could have stepped right out of them. We also saw the charred evidence of the fires of 2016 on tree trunks and downed logs. With all the rain we had in the fall, there was plenty of water in the creeks that cascaded down the steep mountainside. It was late afternoon by the time we reached Joyce Kilmer and our waiting vehicle. Ready as we were to arrive, the bridges over the creek signaling “civilization” still seemed to appear suddenly out of nowhere. The parking lot had remained in the deep shade just about all day, and we were struck by how much lower the temperature there was than on the sunny trail we’d left behind. We’d hiked more than 10 miles without seeing a single person all day. That’s another benefit of hiking in the colder months–especially in the wilderness, you can be better assured of solitude. Let the winter hiking begin. This route of this hike is a composite of several that appear in Milestone Press guidebooks. 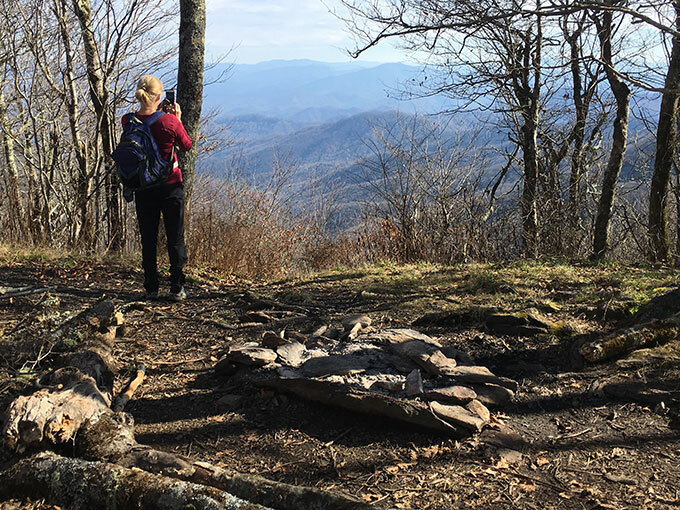 Check out Danny Bernstein’s Hiking the Carolina Mountains or Jim Parham’s Backpacking Overnights NC & SC for loop hikes that don’t require setting a shuttle. 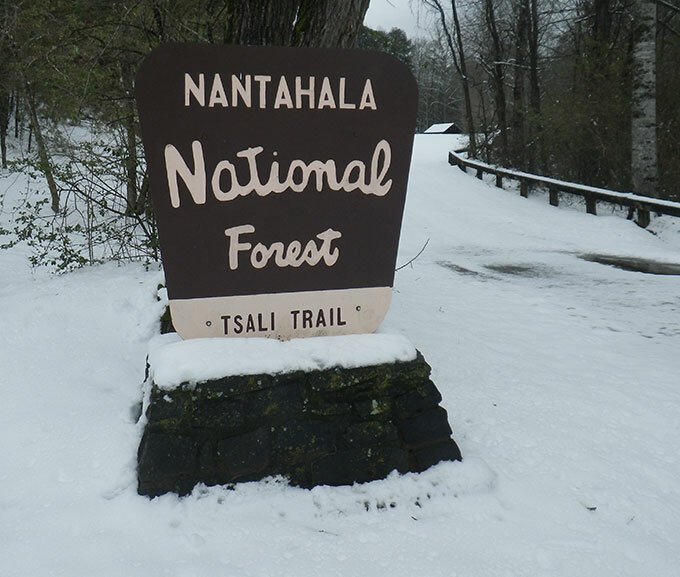 Remember: Always check the weather beforehand, carry extra layers and snacks, and inform someone else of your travel plans when you hike in the winter!